PALM SPRINGS, Calif. – The opening round of the 2018 California Winter League playoffs began with a walk off 5-4 win for the Alberta Grizzly over the British Columbia Bombers. With two outs in the bottom of the seventh inning, Matt Jeffery kept the Alberta bats alive with a base hit in front of Gabe Gunter. Gunter ripped a double to the right-centerfield gap to score Jeffery all the way from first to capture the dramatic victory. The contest was competitive throughout, but the Bombers could not take advantage with runners in scoring position. British Columbia left 12 men on base and nine in scoring position. Jack Landwehr and CJ Harris combined to do all they could through 6.2 innings, but the Grizzly offense did just enough to warrant a round two matchup against the Toronto Rush at Palm Springs Stadium on Friday, February 16 at 12:30pm. Alberta got on the board in the first inning after Brett Thompson singled and eventually scored on a Gunter RBI double. They added one more in the second when Adam Gauthier tripled and scored on a Franklin Jennings groundout. The Bombers got a run back in the third against Grizzly starter Louis Cohen. Trevor Achenbach reached on an error, and after walks to three straight hitters, Achenbach scored to cut the deficit to 2-1. Adam Cornwell relieved Cohen in the third inning with bases loaded and nobody out. Cornwell struck out the side to end the Bombers threat. Trailing 4-1 in the top of the seventh, British Columbia mounted a two-out rally where five consecutive batters managed to reach. Matthew Bendetto singled and scored on an Alex Oleszkowicz base hit. Dhahraun Bivins was then hit by a pitch and Dalton Cozart reached on an error. With the bases loaded, Ryan Smith singled home a pair on a line drive to left field to tie the game at four, but Cozart was picked off trying to get back to second base on the play. Jeffery pitched a third of an inning and got the win, while CJ Harris took the loss. Landwher did not factor in the decision after allowing four runs (two earned) on five hits with seven strikeouts and one walk over five innings of work. Gunter finished his day 3-for-4 with two doubles and two RBI. Achenbach stood out for British Columbia, as the second baseman finished 1-for-3 with a walk, a run scored and three stolen bases. The Palm Springs Chill defeated the Coachella Valley Snowbirds, 7-1, in the second Wild Card matchup of the day. The Chill scored all seven of their runs in the first three innings and dominated their entire game. The first inning started with three straight hits, including Zach Nehrir’s RBI double to the left-center field gap. Up 2-0 in the second, the Chill added three more runs. Will Decker hit a sacrifice fly, Nehrir singled home a run and Jake Barbee ripped an RBI double to right field to make it 5-0. Rock Smith kept the hit parade going in the third with an RBI single and Decker followed that up with an RBI ground out. The Chill held a 7-0 lead until the top of the sixth inning when the Snowbirds scored their lone run on Toki Tamura’s fielder’s choice grounder scoring Issei Tsumori. Coachella Valley finished the afternoon with just four hits. Donnie Speranza started for the Chill and picked up the win, throwing five shutout innings. The loss went to Koji Morino, who started for the Snowbirds and gave up seven runs in three innings. Both bullpens looked good in the game; only one run was scored over the final four innings. The Chill, the No. 4 seed, advance to the American division semi-final round tomorrow and will take on the No. 1-seeded Palm Springs Power at 10 a.m. at Palm Springs Stadium. Games on the auxiliary field with feature the No. 3 Manitoba North Stars face off against the Canada A’s at 9:00am. Game two will follow with the No. 3 Washington Blue Sox taking on the No. 2 Oregon LumberJacks. 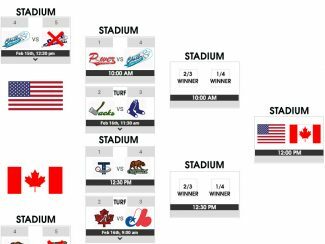 Friday, February 16 is “Canada Day” at the California Winter League. Those with a valid Canadian ID will be admitted to Palm Springs Stadium for just $3. Saturday, February 17 will be the Conference Championship round. Fans can enjoy $2 beer from the concession stand. 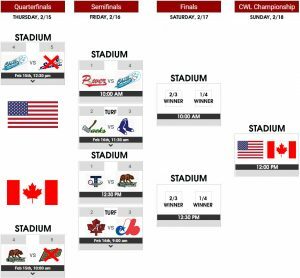 Sunday, February 18 will feature the California Winter League Championship. First pitch is scheduled for 12:00pm. 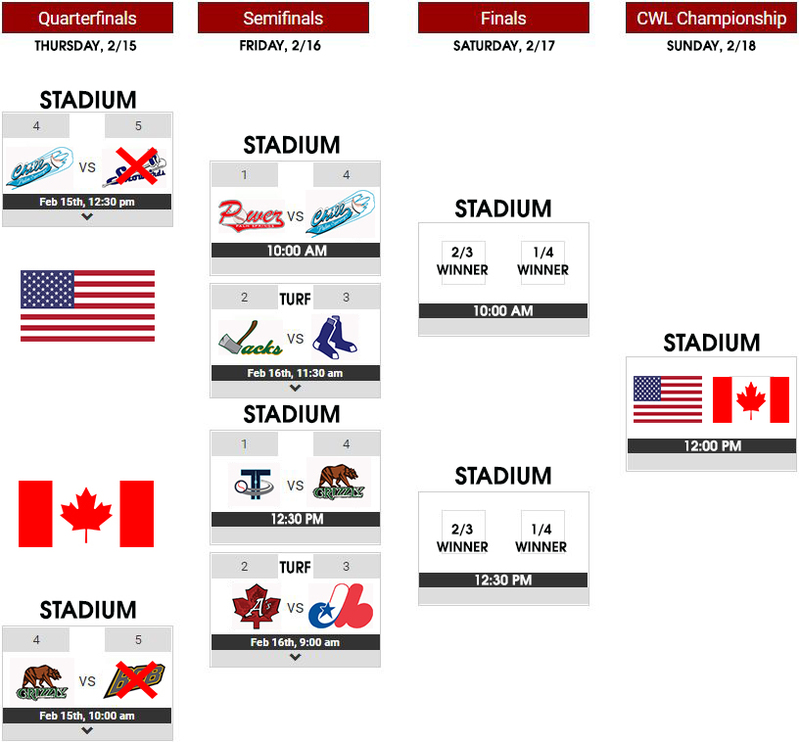 Those not in attendance can listen to CWL playoff baseball on CaliforniaWinterLeague.com.